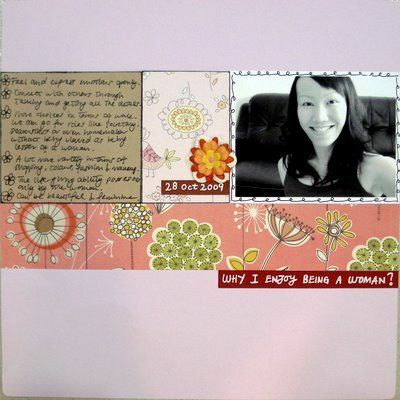 This is a scrapbooking idea where you can have fun with the reasons as to why you love being a woman. I guess you might not have really thought about this before. So why not take some time to note down the best things you love about being a woman? Ok, there’ll be inevitably times where we don’t feel that fantastic about being a woman, yeah, like when we’re on PMS. But most times, I believe it can be a joy being a woman. And if given a choice, would you choose to be a woman again? This layout will be a record to your daughters and granddaughters to show them that you love being a woman, and encourage them to embrace what they’ve come into this world to become, beautiful and joyous women. For me, I love it that as a woman, I can feel and express a wide range of emotions and when things get overwhelming, it’s not awkward if I’m to cry to release the tension. Just imagine how others would look at a man who cries when things get overwhelming… I love it that as women, there’s so much more variety in our fashion, shoes, handbags, colors, and makeup. Can you imagine if there’s only one shade of pink? Women can tell the differences. And of course, there’s other reasons too. So move along now and disclose on your layout, all the reasons or the main reasons you adore being a woman! Enjoy! Supplies used: Cardstocks – Bazzill Basics, Patterned papers – SEI “Dill Blossom”, SEI “Chick-a-dee”; Paper flowers – Prima Marketing; Pink Brad – KCK Craft; White pen – Uniball Signo Broad; Black photo pen – ZIG Photo Signature; Black pen – Zig Memory System “Millennium”; Brown ink – StazOn “Timber Brown”; Corner rounder.